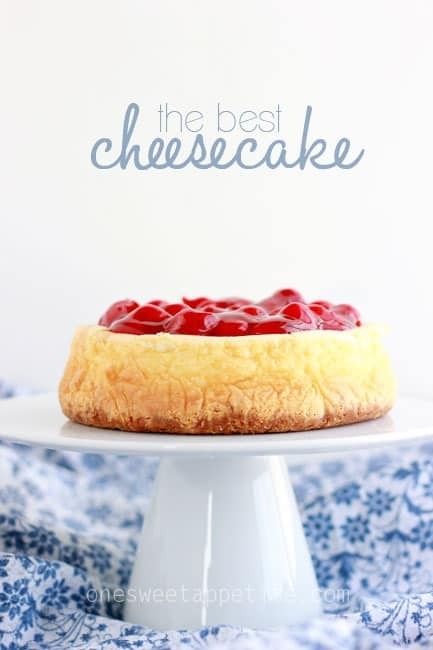 Let’s start this post off with a little secret… I’m not great at baking cheesecake! I’ve had them crack, undercook, overcook, and everything in between. It’s been a rough road for me and this sweet dessert. I knew I couldn’t let it win. A year or so ago I found the perfect recipe. I’ve made it several times for my dad and brother who both agree it’s top notch. My brother (who knows everything) (I really really love you if you are reading this!) even told me it’s better than the ones you find in New York! So now the trick was figuring out how to get it to bake pretty. ..
1. You can try a water bath. 4. Don’t open the oven door. At all. 5. If all else fails top with some cherries! Seriously. Round ten for me and this darn cake and I still had cracks. Bonus? It was cooked perfectly. 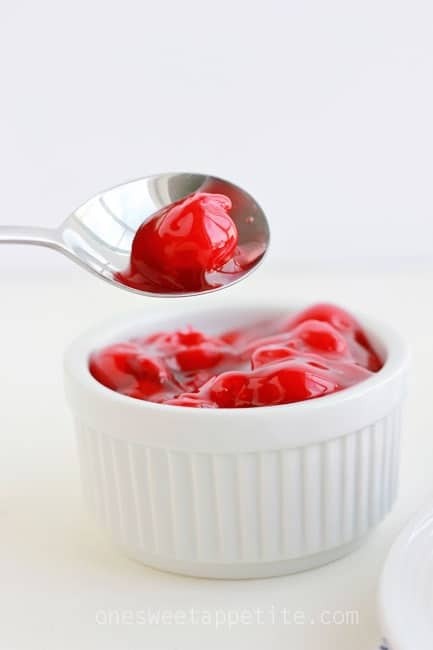 It wasn’t until I opened my pantry and saw some cherry pie filling (where did that even come from?!) that I decided the best solution to my cracking problem was to just top it with some cherry goodness. Preheat your oven to 325 degrees. Line or grease a 9 inch spring form pan. (For these pictures I used two tall 6 inch cake pans). In a small bowl combine the graham crackers, cinnamon, and butter. Mix until you get a wet sand like mixture. Press into the bottom of your pan. Cream the cheese and sugar in the bowl of an electric mixer. Add the milk followed by the eggs by hand. Make sure you scrape the sides of the bowl as you go. Once combined fold in the sour cream, vanilla, and flour. Pour into your prepared dish. Bake for 1 hour. 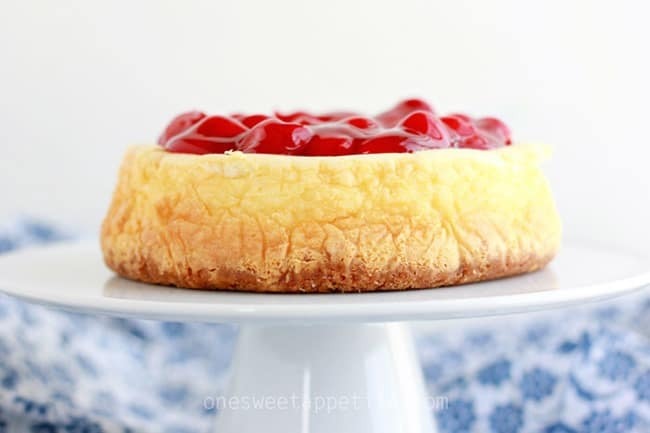 Turn off your oven and let the cheesecake rest until cooled to room temperature. Transfer to the refrigerator and chill for at least 4 hours or overnight. Jesseca, I totally hear your cheesecake pain! Mine always, always crack. 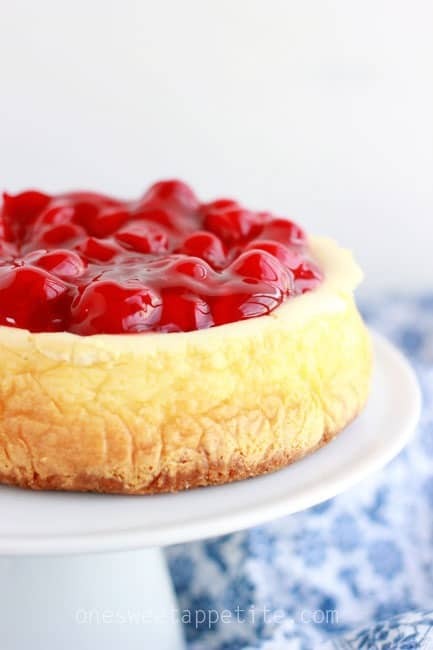 My solution is identical– just top them with the most decadent stuff so no one even sees it 🙂 This cheesecake looks amazing, especially all those gorgeous cherries. Oh my gosh, this looks amazing! I wish I had a slice for breakfast!! 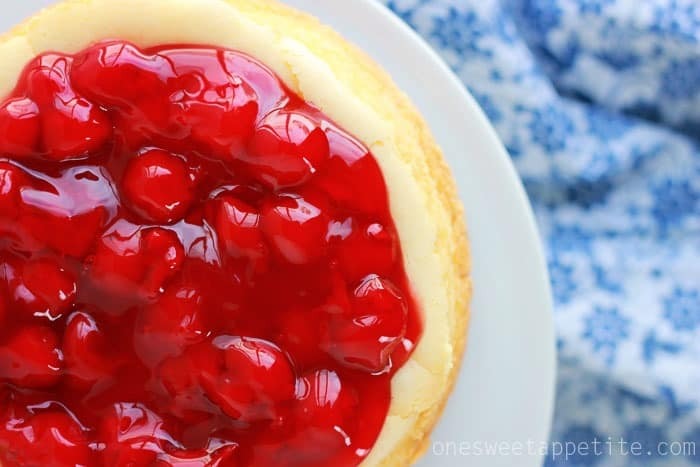 Love the cherries on top to hide the crack – why is cheesecake so hard to get perfect?! These are all great tips! I’ll be sure to implement them next time I make this recipe! This is beautiful and I’m sure delicious! Can’t wait to try it thanks for sharing! OK. Now I NEED cheesecake. Truly NEED. This looks amazing! How did you know Cherry Cheesecake was my favorite. I would get this for my birthdays growing up because I didn’t love cake. Looks delicious! Leanne!! You can have cheesecake with me anytime! My hubby loves cheesecake! I will definitely be trying this for him! Pinning now! Thanks for the pin Kimber! This looks so delicious especially with the cherries on top! Its been so long since I’ve made cheesecake. Thank you for sharing this recipe! Ummm, I’ll be right over! This looks so yummy! Cheesecake is one of my favorites. This looks delicious! I am definitely pinning this recipe for later. I’ve been wanting cheesecake for a while now. I’ve never made it before, but I could probably handle this one. Thanks! I honestly don’t know how this can be done in an hour. I baked for 80 minutes at least and it was still really jiggly. I just turned my oven off and am letting it cool now. Hoping it’s ok after it sets in frig.